Travel the "Regina Viarum" -Queen of all roads- the Via Appia Antica and stop for a guided visit the Catacombs (Underground burial place, outside the City Walls) ... visit the world famous ruins of the Ancient Roman port of Ostia Antica... And much, much more! Or how about a Tour exploring all the various site of Dan Brown's "Angels and Demons"? By far one of the most popular itinerary, a real highligh! It includes both driving and geting out at locations such as the Aventine Hill where St Peter's Basilica may be viewed through the famous "keyhole"... the Capital Hill for an incredible view of the City.. the Trevi Fountain... Piazza Venezia, with the Victor Emanuele Monument, the Colosseum.. all of which will be bathed in beautiful light. 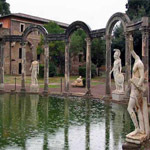 Tivoli is world famous not only for the legendary Villa D'Este with its Italian style gardens adorned with hundreds of hillside fountains (a must see) but also for the exceptional remains of Hadrian's Villa, the largest Roman Villa from the 2nd Century AD. Not only: this is where the world largest travertine marble quarries are, exploited ever since the Roman era and still in use. the largest Roman Villa from the 2nd Century AD. Not only: this is where the world largest travertine marble quarriesare, exploited ever since the Roman era and still in use. (Just imagine that both the Colosseum and The Getty Museum in Los Angeles have been decorated using Travertino from Tivoli). Leave the hustle and bustle of Rome targeting Romans ever since favourite getaway: I Castelli Romani wine district. Castel Gandolfo, Ariccia, Frascati, and several other communities "spot" this gently hilly area located in the Southern suburb of the City. A very popular destination, much appreciated for its wines, porchetta (roasted-pig), breads as well as its natural beauty. On clearer days you can recognize the profile of Michelangelo's St Peters dome in the distance, but most importantly you can enjoy a meal by one of the many "fraschette", i.e. typical local down-home restaurants - as you experience a moment of genuine dolce vita. Stop along the Appian Way, and visit the Catacombs, if you'd like, on your way there. Eighty miles North of Rome is the hilltop town of ORVIETO, the most important community of the ancient Etruscan world. Stroll through its Medieval streets and alleys. 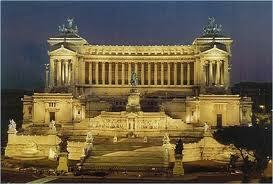 Visit its stunning Cathedral and maybe enter the Etruscan Underground. ASSISI, birthplace of Italian Patron Saint Frances is 1 hr further. You could choose to visit both places or simply drive as far as TODI, 20 miles further North East, another much acclaimed Umbrian village, considered the "ideal place for living in the world"